Emirates, the world’s largest international airline, will introduce regular scheduled commercial Airbus A380 services to Osaka (KIX) in Japan on 28 October 2018. The deployment of the double-decker aircraft represents a capacity increase of 38%, and means that travellers will enjoy the comfort of an A380 to and from two Japanese gateways, as the flagship aircraft already operates daily from Narita International Airport. The A380 will replace the 777-300ER aircraft currently operating on the EK316/EK317 service to and from Osaka. The Emirates’ Airbus A380 aircraft serving the Dubai-Osaka route will offer a total of 489 seats in a three-class configuration, with 399 spacious seats in Economy Class, 76 fully flat-bed seats in Business Class and 14 First Class Private Suites. Emirates flights to and from Japan cater to the needs of Japanese travellers with Japanese-speaking cabin crew on board. Emirates award-winning entertainment system, ice, offers up to 3,500 channels of audio and visual entertainment, including live TV and more than 100 channels of Japanese content, movies, TV shows and music. Emirates customers can enjoy a generous baggage allowance, with 50kg for First Class, 40kg for Business Class and up to 35kg for Economy Class passengers. First Class customers on Emirates flights to and from Japan can experience traditional Kaiseki (multi-course meal) cuisine and Business Class customers have the option of a traditional bento box. Emirates is the first Middle Eastern airline to serve Kaiseki-inspired meals on board. The Emirates A380 is also renowned for its First Class Shower Spas as well as the Onboard Lounge for First and Business Class passengers, the most popular social spot at 40,000 feet. 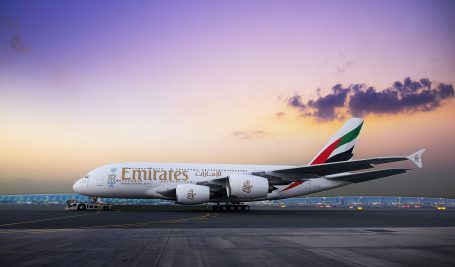 As Osaka becomes the latest destination on Emirates’ global network to be served by its highly popular A380 aircraft, passengers travelling from the Kansai region in Japan can enjoy a seamless A380 experience to popular destinations via Dubai, including London, Moscow, Mauritius, Paris, and many more. Rich in history, the Kansai (West) Region is home to many well-known attractions like Arima Onsen – one of the famous and oldest hot springs and Nara, the former historic capital. Visitors can also admire historical landmarks including UNESCO world heritage sites such as Himeji Castle which can be reached in around 20 minutes by Japan’s famous bullet train, the Shinkansen. The region is also known as the birthplace of many traditional art forms such as the art of flower arrangement, Ikebana. Osaka is one of seven prefectures in the Kansai region which forms the core region of western Japan. Osaka is also the gateway to Kyoto, Japan’s ancient capital. From Osaka airport, Kyoto is only 75 minutes by train and the International Port City Kobe from where the famous Kobe Beef is derived, can be reached in just over an hour by limousine bus from KIX airport. The arrival time of the service also allows passengers to take advantage of onward domestic flights to destinations such as Fukuoka, Chitose and Okinawa. From 28th October, A380-operated flight EK316 will leave Dubai (DXB) every day at 0305hrs and arrive in Osaka (KIX) at 1655hrs. The return flight, EK317, departs Osaka at 2335hrs and lands in Dubai at 0545hrs the next morning (all times are local). Emirates Skywards, the award-winning loyalty programme, offers four tiers of membership – Blue, Silver, Gold and Platinum – with each membership tier providing exclusive privileges. Emirates Skywards members earn Skywards Miles when they fly on Emirates or partner airlines, or when they use the programme’s designated hotels, car rentals, financial, leisure and lifestyle partners. Japan Airlines (JAL) is an Emirates partner-airline and Emirates Skywards members can earn and spend Miles on flights across its network. Skywards Miles can also be redeemed for an extensive range of rewards, including tickets on Emirates and other Emirates Skywards partner airlines, flight upgrades, hotel accommodation, excursions and exclusive shopping.